The entire menu, with recipes, is on Martha Stewart’s site here. My, what a random menu item! 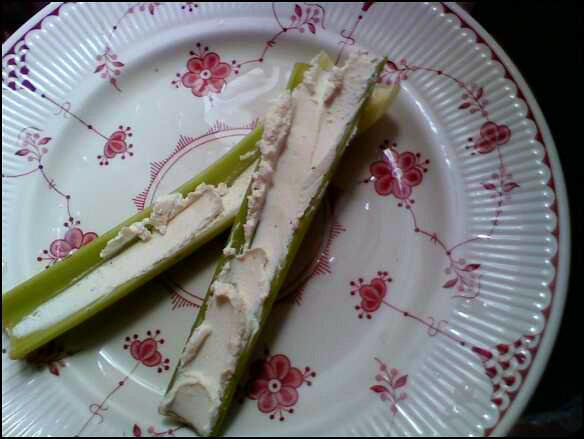 Martha calls this her grown-up version of stuffed celery sticks. It involves stuffing celery sticks, naturally, with a mixture of cream cheese, horseradish, Tabasco, salt and pepper, adjusting for taste. We used goat cheese in place of the cream cheese, and it was tasty. She gives amounts of the spices, but since the original recipe served four, and called for 8 oz of cream cheese and an entire bunch of celery, we just smashed the cheese and spices together until we liked it, since we only planned on eating a stalk or two. It was fine, but I still think this is a weird thing to put in a cookbook. 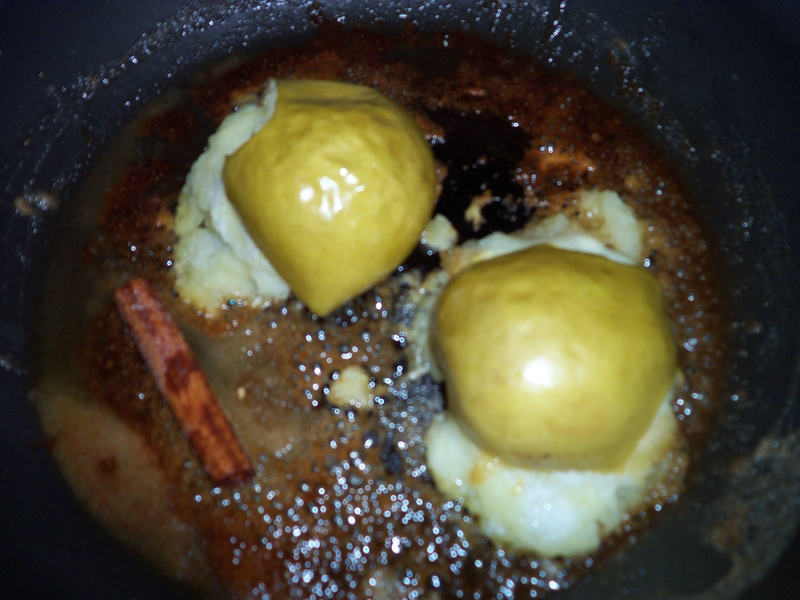 This one involved baking sliced lemons and onions in some white wine and water with chopped thyme until the onions softened, about 40 minutes. Then the flounder was placed on top, and covered with a couple of slices of the lemons and onions, and baked until flaky. The problem I had was that in the time it took to cook the onions sufficiently, the wine sauce had all cooked off and I had nothing to baste the fish with, per Martha’s instructions. I added some water and used that. We have a split decision on this one. 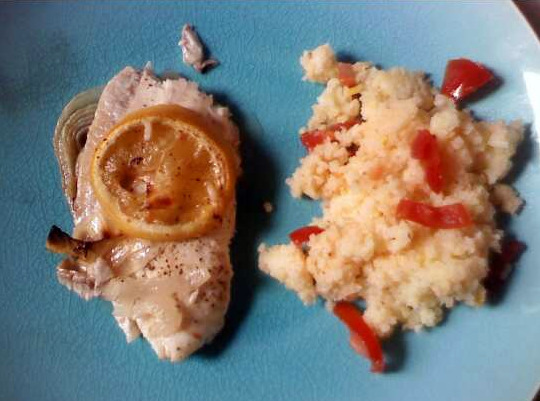 I loved the fish with the onions, and thought it had plenty of flavor from the wine and lemons. The Husband, however, found the flavor too quiet. He added more lemon juice and salt* and that helped. The fish was flaky, tender and moist. By the way, do I want to know where this fish was caught locally? Please tell me it wasn’t at the pond in Byrd Park. Jasmine rice cooked with a pinch of salt and saffron, then mixed with diced tomatoes, butter and oregano. Easy peasy, yes? I managed to botch the rice and it turned out mushy. I am flummoxed, as normally I get the rice to come out perfectly, and I smugly laugh at people who have to use rice cookers. Well, I am eating my words, since this looked like polenta! The flavor was bland; perhaps my pinch of saffron was not big enough? Boo. I was leery of this one, given that I don’t like bread pudding or baked French toast, and this seemed to be veering into that territory. She says it is a traditional British dessert; according to my research, it normally has raisins in it, and maybe cinnamon. 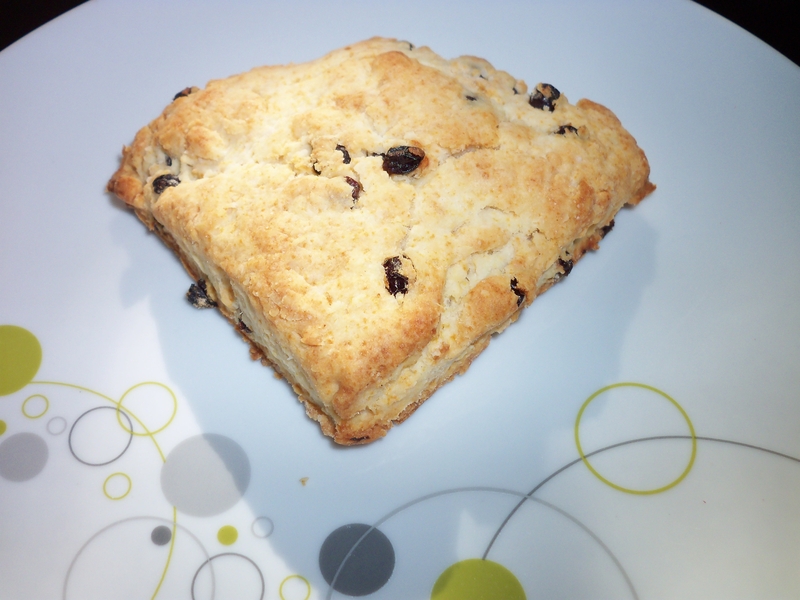 Sandwich bread (cut in half diagonally) is buttered, then placed in the baking dish. An uncooked custard (ick!) 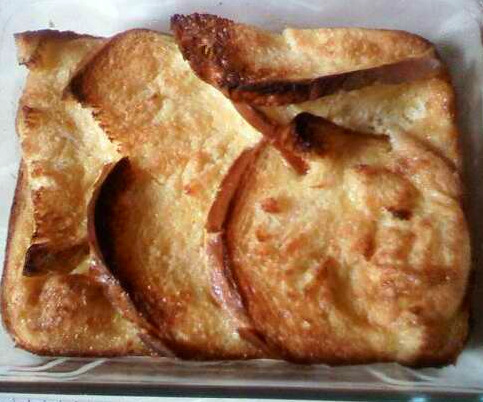 is made with eggs, milk, cream, vanilla, sugar and rum, and poured over the bread. It sits at room temperature for an hour, to get good and soggy (ew), and then is sprinkled with sugar and baked for 25 minutes. It’s supposed to be served with macerated strawberries, but the strawberries in these parts have been gone for a while now, so we used blueberries. Let me take a minute to tell you about the rum I used, Zaya, which is aged for 12 years in oak barrels in Trinidad. It’s smooth, like a nice Scotch, but full of vanilla flavor. It’s for sipping, not for mixing with diet Coke. Delicious! The truth is, I only agreed to make this dish because I could use this special rum in it. Again, we were split. The Husband quite liked it, but he likes bread pudding. I thought the flavor was ok, but didn’t like the mushy, wet bread. This is the opposite of our reactions to the spoonbread, so I guess we are just contrary. I made a half batch, and there was still a lot left over. The more I looked at it in my bowl the more it looked like scrambled eggs to me. No thank you. See why I married him? He’s very wise. This concludes the spring portion of the book, for now. 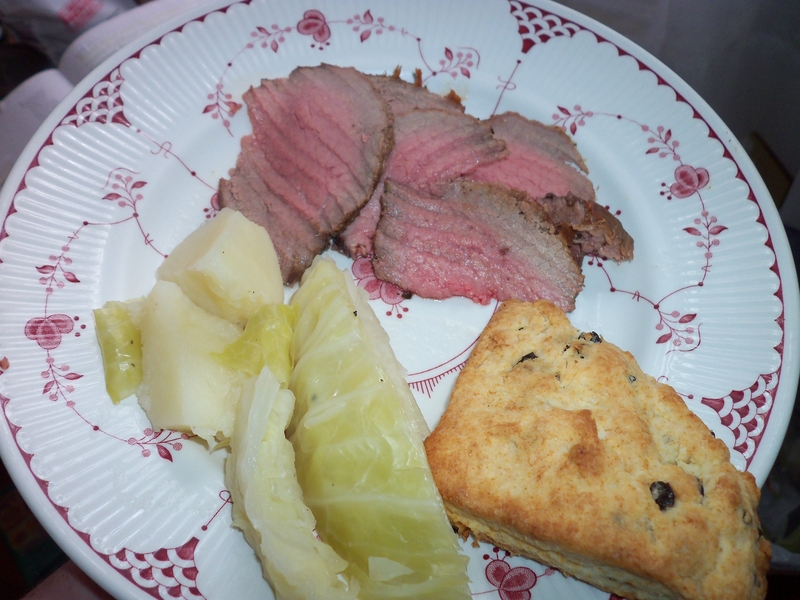 There is still that pesky roast beef and cabbage recipe I have to make up sometime. I’m guessing that will happen this fall. Next up, Summer BBQ! So, evidently, we Southerners (and transplants) are supposed to have buttermilk in our pantries, too, which does not sound very sanitary. We also are supposed to grow dandelions in there, so we can eat their leaves. And a chicken or two, and a raspberry bush. And a bee hive. Just so you know. 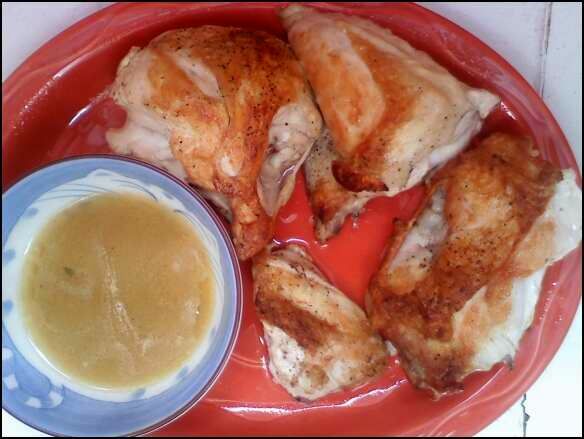 The recipe called for using some chicken parts with skin–thighs, drumsticks and a couple of breasts. In all, I think it was supposed to be about 40 lb of chicken pieces. Instead, we used two chicken breasts, which I hacked in two. The bones crunched sickeningly, but I guess if you are going to eat meat you have to accept the reality that there are bones and such associated with it. The breasts, sprinkled with salt and pepper, were browned in my cast iron skillet (Southern, yes?) in olive oil for about 7 minutes to get a nice crisp on them. Now, this is a decent-sized skillet but there was no room for extra thighs or legs, so I don’t know how she thought the 80 lbs of chicken would fit in one pan. After browning, the chicken went into the oven at 450 for 8-10 minutes, until they reached 160 degrees. Then I made a pan sauce, by cooking up some dry white wine with thyme (I used lemon thyme), then chicken broth, and lemon and butter. It was supposed to emulsify in this last step, which I think was perhaps scientifically impossible (again! But, what do we know about science down here?). The chicken was tasty, but I would add more seasoning, like some garlic and an herb or two to the salt and pepper next time. They had a nice coating and were very juicy and moist on the inside. The sauce was also good, and had a nice lemon flavor. This recipe’s claim to fame is that it called for lemon and thyme (thank you, Martha, for using thyme in two recipes for this meal, so less went to waste). I saw some lemon thyme at the store, and we looooove lemon, so I got it. The herb was very fragrant and actually did smell lemon-y. I am in love with it–it would be great to grow indoors to scent a room. Did I mention that the entire month of June has been a horrible heat wave? The forecast was 97 the day I planned to make this, so we had to have it for brunch, what with the chicken and spoonbread baking. I was a bit irritated about that. Another hit! 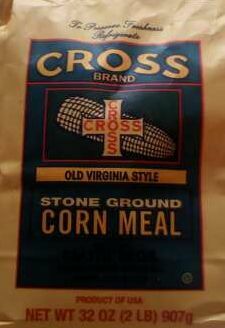 It tasted like a lemon-y, super moist cornbread stuffing, which is my favorite kind of stuffing. We both enjoyed it, me more than The Husband, since he thought it was a tetch odd and mushy at first, but the flavor won him over in the end. I didn’t mind, and liked it with the sauce from the chicken poured on top. We only made a half batch, concerned that it wouldn’t work as a left over. Even so we had some left over, and it was fine re-warmed in a microwave. Preheat oven to 400. 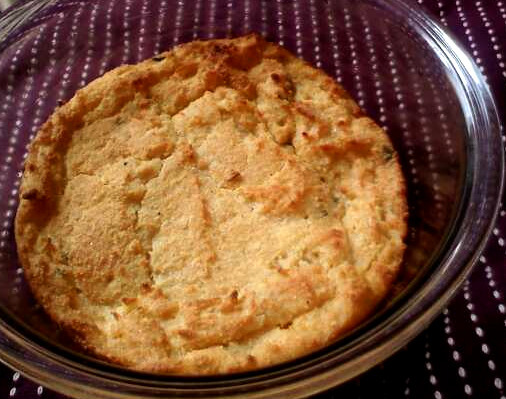 Butter a two-quart souffle dish (or any other dish with sides at least 3″ tall). Whisk together dry ingredients, thyme, zest, salt and pepper. In a sauce pan, heat the milk, cream and butter until scalding (just beginning to steam and bubble around the edges). Pour the milk mixture over the cornmeal mixture and whisk to combine. Whisk in the eggs until thoroughly combined. Pour batter into dish and bake until puffy and golden on top–it will still jiggle a bit but shouldn’t be wet in the center) 20-25 minutes. Let cook 15 minutes before serving. This is essentially a Salade Lyonnaise without the poached egg and substituting frisee with weeds, so the Southern folk will want to eat it. You know none of us speak French, right? (I am not actually Southern, so not sure why I care, exactly. Martha has a habit of not calling things what they are in the culinary world). The motto for shopping for this meal was, if it’s not in this one store (Whole Foods), then I am substituting something. A friend mentioned that she found dandelion greens there before, but there were none on my visit. 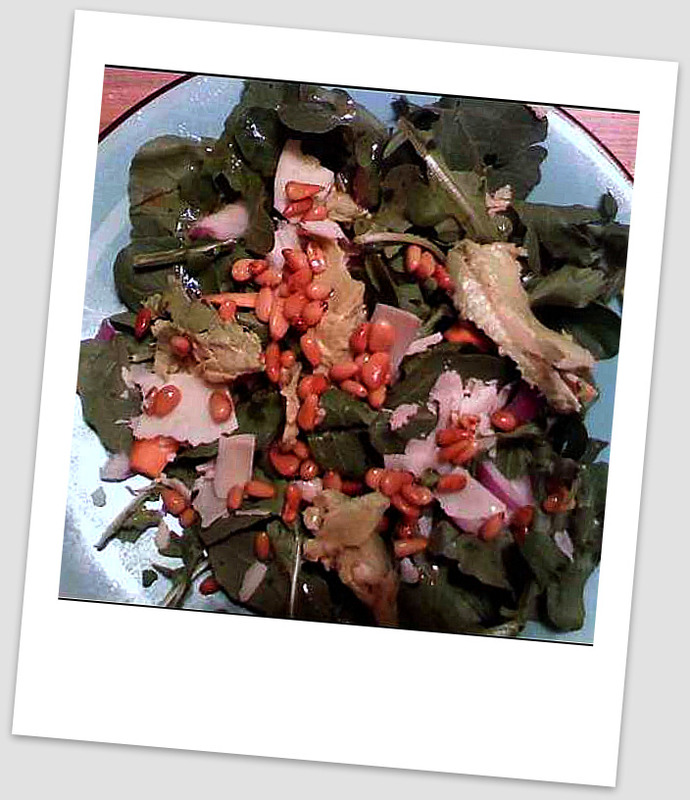 Instead I used arugula–frisee is too tickly! The dressing called for frying some slab bacon (I used a bit of regular bacon), removing it, then sautéing a shallot in a bit of the olive oil and bacon grease–I used barely any of the grease, and much less than called for in the recipe. Then I added red wine vinegar and Dijon mustard (I had been wondering when I’d have to buy more to sate Martha’s mustard obsession after losing ours in the Frig Fiasco of 2010; turns out the very next recipe needed it), and added the bacon back in to coat it. Then the dressing is tossed onto the greens to wilt them and sprinkled with pepper. The salad was ok. It seemed really heavy for hot how it was, and the meal has a lot of fat in it already. I think the salad is better suited as an entrée with the egg on it. I will say, however, that the bacon and mustard flavors were a nice contrast to the chicken and spoon bread! Thus far, this meal really went together well. The buttermilk posed a problem. We don’t have any more of our magic elixir drops to convert milk, cream, etc into lactose-friendly liquids, and they are on back order so we can’t get any more; thus, I didn’t want to buy/consume any buttermilk. I got the closest thing I could find–some whole goat milk with probiotics. It was super tangy and tart. 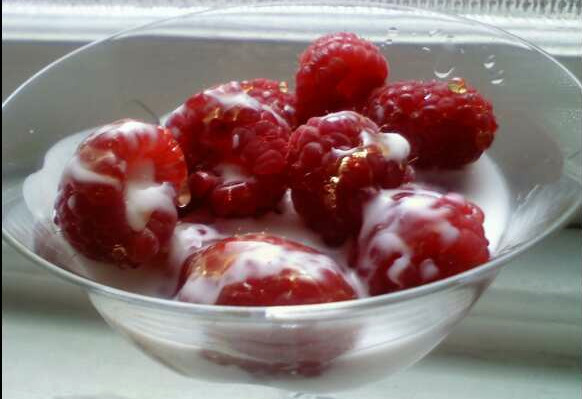 The recipe calls for sprinkling honey over some raspberries, then pouring buttermilk on top. The level of fat in the menu just really is too much. The raspberries and honey were fine, but the goat milk didn’t add much. The flavors didn’t integrate well, so The Husband tried mixing the honey into the milk, but that didn’t help. He suggested adding a nut. I suggested pouring off the milk and just eating the berries, which is what I did. This was pretty much a winner. I would make most of it again when the weather is cooler. It was a heavy meal for how hot it was (not Martha’s fault, I suppose), but at least we didn’t need to eat dinner that day; it kept us full for hours. This is definitely a weekend-only meal, as I can’t see making this after work. The spoonbread took a while, and it has to be done in time to turn up the oven to bake the chicken. Then you’re essentially cooking the chicken sauce and the dressing at the same time, so the timing can be tricky. Raspberries: Hard to say, since we didn’t use the buttermilk. After all that heavy food, I think a bowl of plain raspberries would have been just fine. You probably didn’t notice, but the numbering got off at #16, so I have fixed it. Not as close to halfway as I thought! I thought this meal was going to be half-assed. I barely even tried, only made half the dishes, didn’t buy the best ingredients, and yet. AND YET! It was delicious! I wasn’t looking forward to making this meal, but I need to move forward so we can get to the Summer section, seeing as it’s been a millionty degrees and is most assuredly summer, even if the calendar says we have a few more days left of spring. We are on track to have the hottest June EVER. It was “only” in the upper 80s today, so I thought I should cook something before it gets hotter this weekend. I decided at the last minute to make this, and went shopping after work. I went to one store, Kroger, and just bought what they had, so there was no super-fancy prosciutto or Fontina involved. I didn’t have high expectations. As I said, I made this the cheap and easy way. The recipe calls for store-bought pizza dough. Kroger doesn’t carry this, so I bought a thin Pillsbury crust. I didn’t like having to buy this–it can taste like chemicals to me, and it doesn’t have the proper pizza crust texture. I can make really good crust myself, using a Mark Bittman recipe, but there was no time. 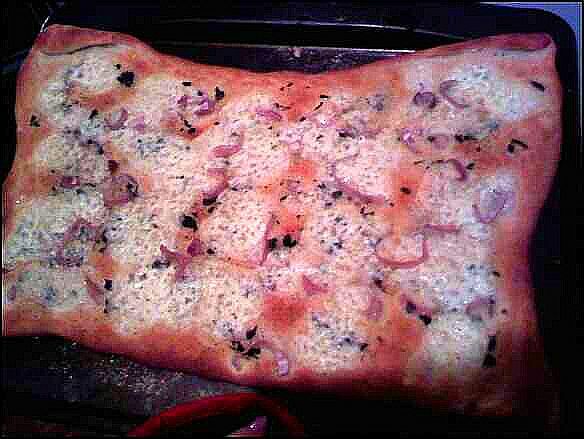 The crust was brushed with 1 T of olive oil, sprinkled with chopped fresh marjoram (the recipe gives a choice of marjoram, oregano or thyme), topped with 4 oz of sliced Fontina, a sliced shallot, salt and pepper, and a final drizzle of olive oil. She says to flour the baking sheet, but I used corn meal as I normally do when I make pizza. Then it’s baked–you can see that I overbaked the crust a tad. It turned out really well! The Fontina and marjoram were a good combination, and who doesn’t love shallots? 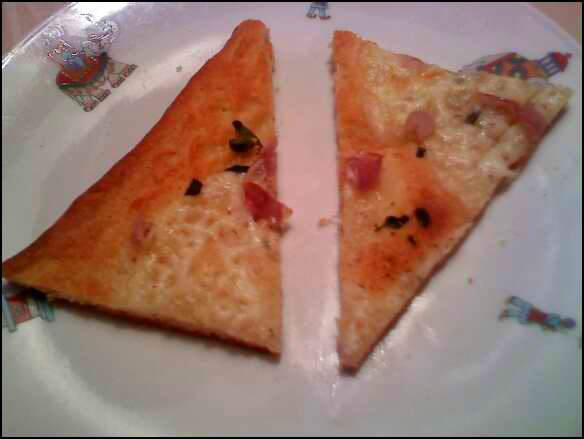 I am curious to try making this again with a proper pizza crust to see which version we like better. We have both the herbs and cheese leftover, so it might show up again soon. 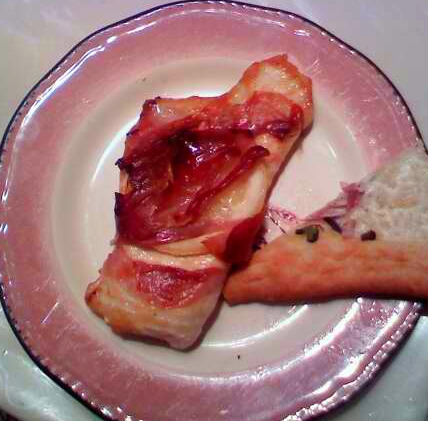 By now we all are aware that The Husband doesn’t eat pork unless it’s cured, so prosciutto=yes, pork chops=no. Besides, pork wrapped pork sounds kind of redundant and heavy, especially after a cheesey first course, so I substituted chicken breasts pounded thin. It’s easy peasy to make this: place two slices of prosciutto on a work surface, top with a thin slice of lemon, then the chicken (which has been salted and peppered), another lemon slice, then wrap the prosciutto around the top, pressing it closed. Then it’s cooked in a skillet in olive oil until done. I had trouble wrapping the cutlet, as the prosciutto was too thin and fell apart, so it didn’t have the proper coverage. Oh, my. This was delicious! The lemon gets steamed and softened enough that you can eat the peel (make sure you use organic lemons!) and it contrasts nicely with the salty prosciutto. The grocery store didn’t have any fresh looking escarole, so I didn’t get to make this. It involves sautéing garlic in oil, then wilting the escarole in it, so we’ll just pretend it’s fine and not bitter. I didn’t make these, either (again! The Spring desserts have been problematic). It involves mixing up some ricotta cheese (which we can’t eat) with lemon zest and confectioner’s sugar, and spreading it between two Amaretti cookies, which we don’t like. I think something with blueberries would have been nice after the lemony meat. Be very grateful I did not invite you over to partake in this meal with me! I hope no one got complacent after two good meals, because this was Not Good. Oh, where to begin? So many things went wrong; some of them our fault and some of them Martha’s. First of all, the recipe called for two pounds of skinless, bone-in chicken breast. The Husband was dispatched with a list, and somehow he ended up bringing home drumsticks, a fact that I didn’t realize until I pulled the bag of chicken out of the refrigerator at 8:30 on a Sunday night. Now, I will not fault him because he did the shopping at the beginning of a nasty bout of stomach flu, and perhaps he was delirious or rendered blind to my handwriting. Because The Husband was still recuperating when I made this, I only made a half batch since I knew I would have to go it alone. I contemplated inviting a friend or two over, but since that would involve vacuuming I decided not to. You may thank me when you see me. The chicken was poached in some unsweetened coconut milk, which was seasoned with sliced ginger, scallions, and garlic. After the chicken cooked, it was removed, the sauce was reduced and then some fish sauce and lime juice were added to the liquid. Unfortunately, the sauce had a very unpleasant grey tone, probably from the dark meat chicken. I decided while eating this that I really don’t care for the texture of drumsticks. I can’t even describe it, but it seems too chewily flesh-like. I have probably just ensured that I will never eat a drumstick again, now that I have typed that. The grey sauce was really not working for me, and it had a viscous texture even though I had strained it. Just writing this out makes me feel a tad queasy. The color of the sauce and meat texture are not Martha’s fault, since we didn’t follow directions. However, the sauce itself was too bland even though I had anticipated this and doubled the seasonings! It needed more flavor, like a red curry paste. And to not be viscous! I don’t think I had ever eaten watercress on purpose before; it may have been mixed in a salad or two that I ate once upon a time. So, I was surprised it tasted spicy, like a radish. Therefore, it seems odd to me that it was served with a dressing of heated oil with garlic and chile in it (Martha gives the option of jalapeno, serrano pepper, or red chile flakes). So, it was spicy stuff on spicy leaves, much like the redundant coffee affogato from last month. I would have preferred the heat in the poaching broth. These involved cooking some rice noodles, then mixing them with beaten eggs, bean sprouts, ginger, and scallions. I think I added too many noodles, as I had nearly twice as many pancakes as it was supposed to make. Martha said to pan fry them in 1/4 cup oil, which was waaaay too much! Look how greasy they were! The second batch was a bit more edible, as the first batch soaked up most of the oil. 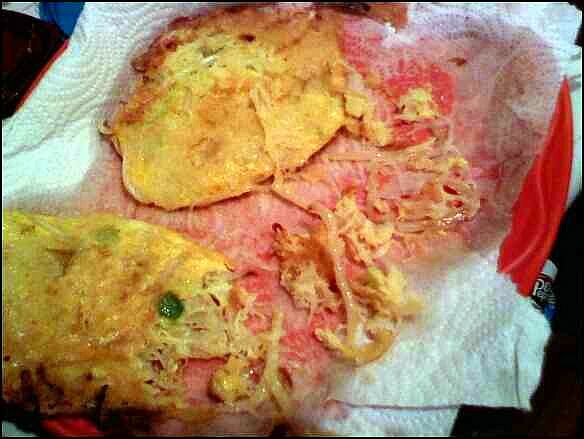 That said, the flavor was ok–like a noodle-y, gingery egg foo yung. They might work for a super kooky brunch, if you add some shrimp or chicken for more flavor, but they didn’t do much for the entrée and spicy salad. The dessert was a milkshake made with green tea ice cream, milk, and a bunch of mint. Since there is no lactose-friendly version of green tea ice cream that I know about, we skipped this one. I was still hungry, after not finishing my chicken or noodle cake, so I had extra salad, which was hardly any fun at all. Not all of that is Martha’s fault, but her bland sauce, greasy noodles, and weird salad are. In fact, typing that up brought to mind the greasy Swedish fest from Winter and the Horrible Salad streak. Martha declares this a perfect midnight supper. Do people really eat three course meals at midnight? 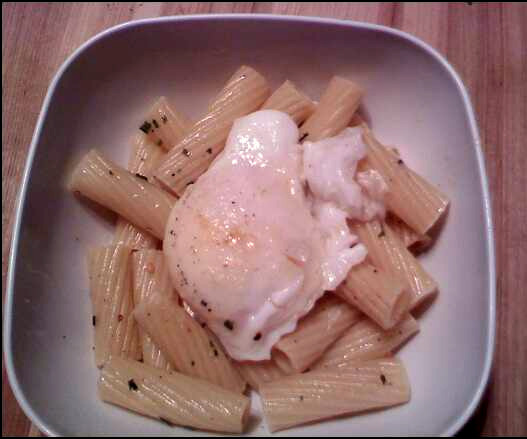 The pasta and eggs is a simple recipe, easily cooked for a weeknight, which is exactly what I did. 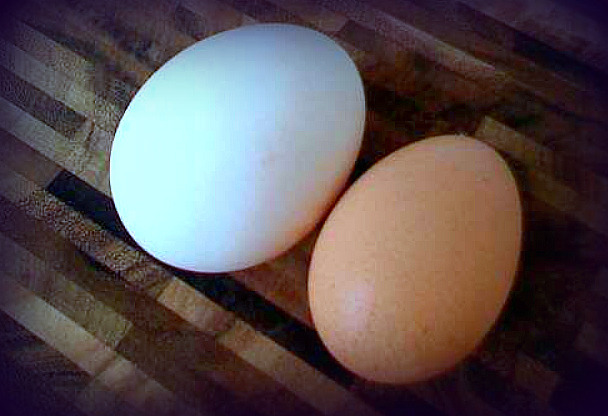 I had gotten duck eggs from a local farm and thought this would be a great way to try them out. The recipe calls for two per person, but the duck eggs are ginormo, so one sufficed. (They are also quite hard to crack; it took five whacks against the side of a bowl). I was supposed to use lasagna noodles as the “pasta shards”, but I accidentally bought some that were no-cook (thanks, Trader Joe’s, with your super tiny No-Boil font! ), so I had to use rigatoni instead. (Can you boil no-cook noodles?). The boiled pasta is tossed with some olive oil, red pepper flakes, chives and parsley, and a bit of reserved pasta water. While the noodles were cooking, I poached the eggs, individually, then tossed them in a pan with some browned butter. The eggs were then ladled onto the pasta. I am sorry my runny yolk photo didn’t work out, as it’s definitely a more interesting dish when viewed through the lens of yellow goop. I like runny yolks, and if you don’t there is really no need to make this dish, as you may be permanently traumatized. The yolk is needed to make a “sauce” otherwise it’s pretty dry. And the egg doesn’t cook like in a carbonara, so it’s not like that, either. Just plain ole runny, delicious egg yolk. The duck egg had a nice, rich yolk, so it was a good choice for the dish. The overall entrée was fine, but not spectacular. We both thought it needed another ingredient to make it really good, but we couldn’t think of what that might be. That makes us no better than Martha, I suppose. The salad, on the other hand was sublime! It was served after the pasta, as a second course, or secondi. There’s a side bar about how to make a great salad–balancing texture, appearance and flavor, and this one does all that. It consists of arugula, avocado, carrot strips, red onion, shaved parmesan, and pine nuts that have been toasted in olive oil. The oil that the nuts cooked in is used as the base for the salad dressing, with a bit of red wine vinegar and lemon juice for acidity. The oil picked up the nutty taste and really makes this a hearty dish. The sum was definitely more than its parts and we both loved it, although The Husband didn’t like the avocado in it, and gave his to me. I enjoyed it so much I woke up the next morning thinking about it, and had some for breakfast! Combine oil and pine nuts in a medium skillet and cook over medium heat, tossing occasionally, until nuts are golden brown. Remove from heat and let cool ten minutes. Use a slotted spoon to transfer the nuts to a plate, then pour oil into a bowl and mix with vinegar and lemon juice. Mix greens, carrots, avocado, carrots and onion in a bowl, toss with nuts and dressing. Top with cheese shavings. 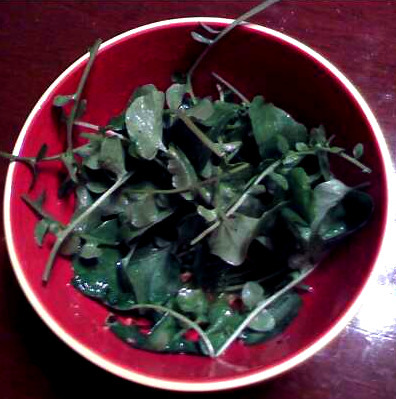 Here’s a tip: we had a ton of arugula left over, having bought a sizable bag of it at the farmer’s market. I made a pesto with the arugula, olive oil, parmesan, and pine nuts. Yum! I put it on a pizza with some mushrooms and orange peppers, and the barest sprinkle of cheese. It was delicious. 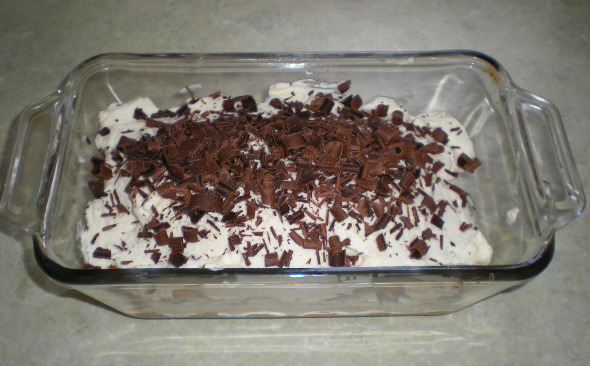 Due to the dairy and chocolate in the recipe, I passed on making it myself, but will soon have a guest review by a friend who volunteered to make it!